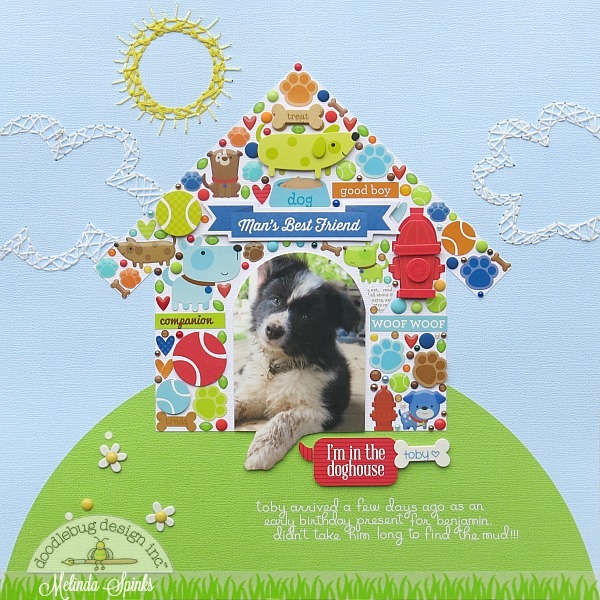 The new Puppy Love collection has been in play on the blog for the past two weeks with the most adorable projects from the design team. 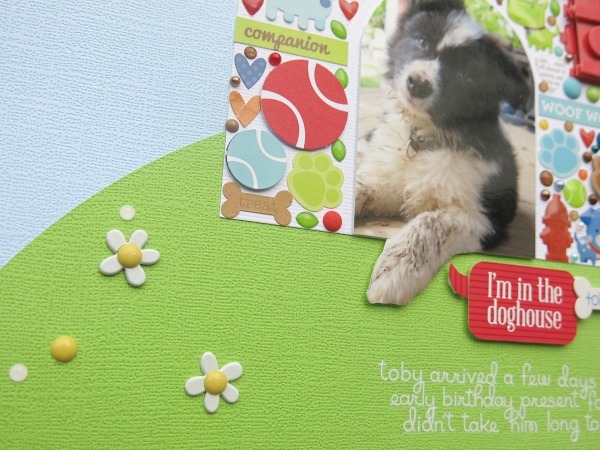 Hopefully you have been inspired to drag out those photos of your favourite K9 friends and whip up a creation or two. My layout today is one you can re-create with all your left over bits and pieces which is a good way to get the absolute most from your products. This is my son's beautiful puppy 'Toby' who came along for Ben's 10th birthday and they have been inseparable ever since. Toby sure has been a ball of fluff and trouble chewing everything in sight... especially shoes *groan*. This little speech bubble was absolutely perfect for this photo as Toby was covered in mud and completely banned from coming inside. More fun stitching. 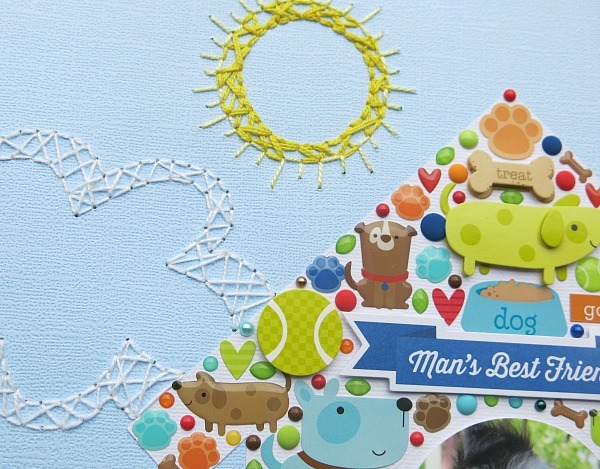 I really wanted to have clouds and the sun on this layout to complete the look of a whimsical picture but I didn't want them to be solid paper so I decided that hand stitching would make a better choice. 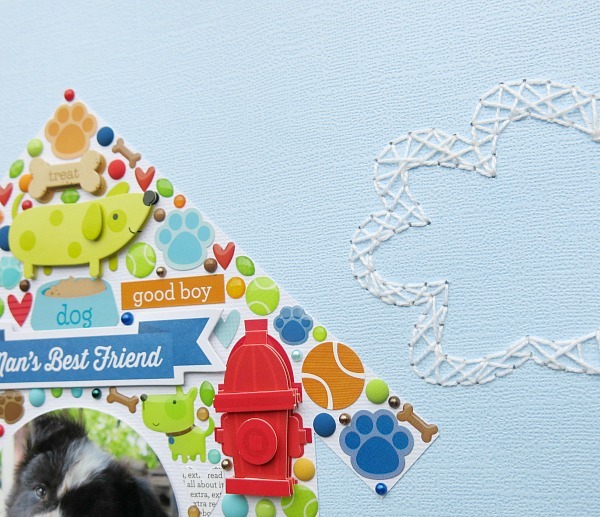 The little dog house was created by simply cutting out the shape from white cardstock and adhering all my bits and pieces from the collection. You could also cut various icons from left over patterned paper and add them using foam pop dots for the added dimension. 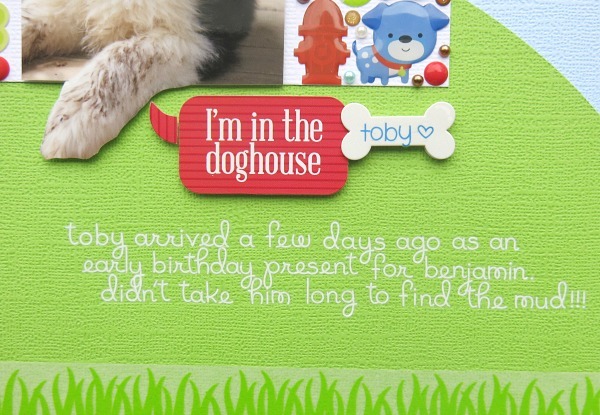 I wanted the photo of Toby to be the same shape as the doorway to the little dog house but that meant I would lose his cute paw from the bottom of the pic. So, I decided a bit of deep etching was in need to keep the paw as part of the layout. So adorable as always--Your stitching details are amazing! Such a fun, sweet page! I love this collection. Lovely layout! The stitched sun and clouds are amazing! What a delightful page! I love the dog house...so creative! The stiching is such a wonderful detail. Awesome LO!